Snow has landed in Aberdeen but it won’t be lying anytime soon at the international airport. Sweepers, snow ploughs and de-icers were all on call this morning to combat the weather as snow fell across the north-east. The heavy duty machinery keeps runways and taxi lanes clear of snow and ice allowing flights land and take off from the airport. Steel wire brushes, attached to the middle of the ploughs, rotate at high speeds clearing snow from the 1,953m long runway before being launched off the tarmac by a blower at the end. A snow cutter is then used to reduce the snow banks created by the blower. It shoots the residue into the grassy area before de-icers give the tarmac its finishing touches. Reaching speeds of up to 24mph, it takes a convoy of snow machines just 30 minutes to completely clear the runway and get the airport back in full operation. 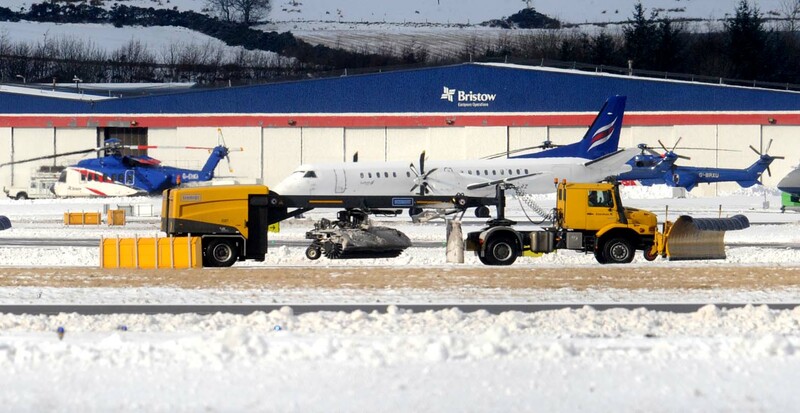 Robert Paterson, airside operations manager at Aberbeen International Airport said: “The snow team is very proud of their work. They come in about 3am in the morning to start their operations. We need to be ready for 6am and it’s very rare that we are unable to do that. “There are times when snow is higher than the 13mm regulation that we are allowed on the tarmac – in that case we close the runway to sweep the snow off to get it back to operational. We call this ‘black top’ condition.